The Canadian government has announced new protections for the roseate tern, but there were just 73 pairs this year in Nova Scotia and federal scientists still don’t know why numbers continue to decline. The Canadian government has announced new protections for an endangered seabird found on a handful of islands off Nova Scotia, but federal scientists still don't know why its numbers continue to decline. The critical-habitat protection order is meant to help the survival of the roseate tern, and applies to four islands: Sable Island, Country Island off Goldboro, and North Brother and South Brother islands near Pubnico. Sable Island is already a national park and migratory bird sanctuary, while the Brother islands are provincial wildlife sanctuaries. But the new order not only applies to the land, it extends protections 200 metres into the water where the graceful, medium-sized bird fishes for food. "It makes it illegal to destroy that habitat," said Andrew Boyne, head of conservation planning for the Canadian Wildlife Service. For instance, he said, it will be forbidden to build a wharf or disturb the seabed, which could hurt the fish populations the bird depends on. Adult roseate terns have a black cap and black bill with red at its base, and a long white and forked tail that resembles long streamers when it's in the air. The birds live on the coasts and islands along the Atlantic, Indian and Pacific oceans. The Canadian population can be found almost exclusively off Nova Scotia, though they also live on Machias Seal Island in the Bay of Fundy and the Magdalen Islands. This year there were just 73 breeding pairs in Nova Scotia, about half the number about a decade ago, Boyne said. "We've been working quite hard over the last 15 years to put in place protection like this order puts in place," he said. "And the population has continued to decline." The issue, he said, may be what is happening during the seven or eight months the birds are not in Canada and either migrating along the Eastern Seaboard or wintering in Brazil. 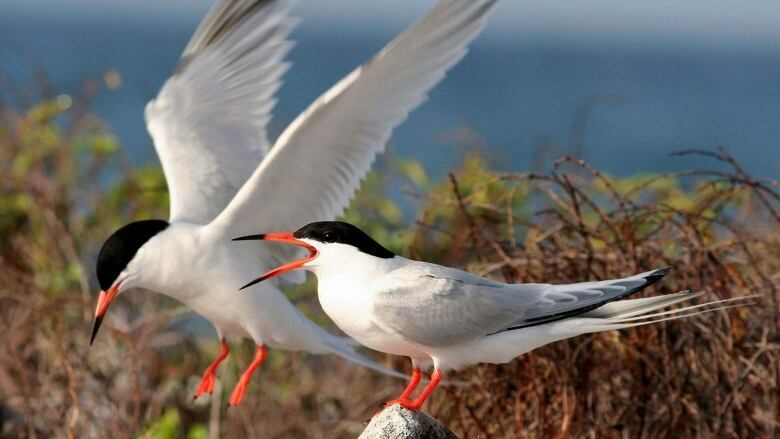 Scientists have banded Nova Scotia roseate terns and depend on bird enthusiasts to spot the bands and report locations to the Canadian Wildlife Service. It is "needle in the haystack" work, Boyne said, but it has led to the discovery that Nova Scotia's rare population stops in Cape Cod during its migration. He acknowledges there isn't much human activity around the four Nova Scotia islands now under protection, but said the order is in place in case something does happen. One of the biggest threats facing the birds in Nova Scotia are two common species of Canadian East Coast seagulls: herring gulls and black-backed gulls. The larger, more aggressive birds prey on tern eggs, chicks and adults. However, non-lethal control methods such as destroying gull nests and scaring the birds using noisemakers seem to have helped control gull populations, according to the Species At Risk Act registry. Another threat to the population is mink. According to the registry, a single mink killed almost the entire population of chicks from the Brother islands colony in 2003. The animal was captured, but another mink devastated the colony in 2004. Still, there's hope. Ted D'Eon is a pharmacist by trade but he's been monitoring the Brother islands and the wildlife that lives there since 1973. He said this summer's drought conditions in southwest Nova Scotia were good for the terns. "We had really good success with the terns," he said. "Our numbers are up, we had a really good food supply this year and there was no great amount of predators."